Fast on the heels of Ski Lodge‘s release, I am today releasing the first update (1.0.1) to this ultimate snowfall, trail map, and overall mountain companion app. This release brings support for display of base depths directly alongside recent snowfall info. This is a user preference, and like all preferences is available in the iPhone ‘Settings’ app. This release also adds support for simple reordering and deletion support in your Favorites list. These two simple changes help make Ski Lodge even easier to use and more helpful. Looking forward, Ski Lodge 1.0.2 will be the App Store next week with even more great features. As a bonus, in celebration of both this release and the holidays, Ski Lodge will be going on sale for $1.99, for a limited time only. This makes Ski Lodge perhaps the best value you’ll encounter this whole season. That $10 aprÃ¨s hamburger will feel like unnecessary extravagance in comparison. 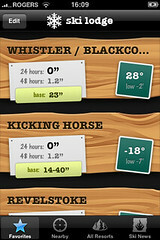 I don’t ski, but this app looks amazing! and last, the trail maps for Summit at Snoqualmie doesn’t work right, all I see is web code. and when I go to look at Crystal Mtns I’m greeted with a 45mb download (is that what is suppose to happen?). Both of those are in Washington State. Thanks for your help and I look forward to hearing back with you. Awesome app!! What about a link to a weather site on the resorts page? Better yet, a mobile weather site for us suckas with edge..
I’m still looking forward to see NewsFire on the iPhone. Although I don’t ski and live in Europe, I bought Ski Lodge today for 0,79 â‚¬ on the iTS just to see how a DW-App looks like on the iPhone. What can I say? Really great stuff! Ouch! Wish I’d waited a couple days to buy. Oh well, early adopters blues. Love the app, but wish I could view trail maps in landscape mode. Any chance for this in a future update? Cool. Now that you have your first iPhone application, does this mean you will do more of them? I would especially really, really like NewsFire for iPhone. If that could sync with NewsFire on my laptop, that would be RSS-heaven :) I use netnewswire now, but that is only because of the syncing. 1.0.2 was submitted for review yesterday. European support is planned in 1.0.3, which is to say that it’s the next thing on the table. Great work David! I love that you have Revelstoke as a start-up default. I am sure it was a great big hassle to get all the resort data and that the data is ever changing. Well done! One resort that has new lifts is Kirkwood in South Lake Tahoe. Just an FYI as the new lifts are not on the maps in Ski Lodge. Great app but I cannot figure out how to zoom in on the maps. Great App… too bad it only features the big resorts… my ski hill isn’t on the list… as are many others… will there be additions in future releases? This application looks superb, its far more polished and much better thought out than the other ski related app’s, great job David. Do you have an estimated release date for 1.0.3?